(Mesa, AZ) – A New Leaf is receiving a record number of back to school items this year to benefit 150 children staying at A New Leaf’s shelters and affordable housing units – all because of a generous donation from International Cruise & Excursions (ICE), Inc. 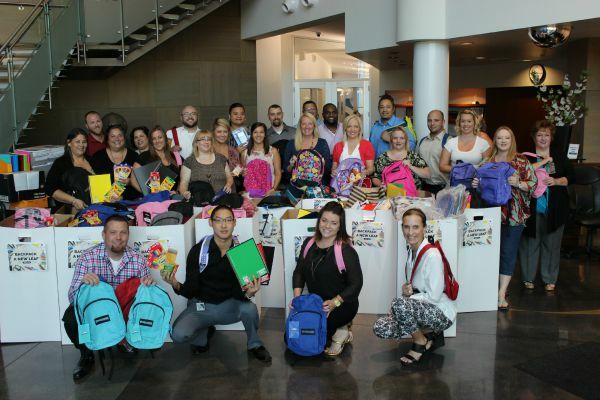 The local company, based in Scottsdale, received an outpouring of support from employees who gave a record number of donations to provide to A New Leaf’s families and children. This year the donation drive has been so popular that employees have filled up a caravan of large vehicles to deliver the items. A New Leaf’s back to school campaign ends August 1, 2015. A New Leaf operates the La Mesita Apartments, an 80-unit affordable housing complex, and the La Mesita Family Homeless Shelter located at the La Mesita Campus in downtown Mesa, Arizona, among other community programs.